Comments Off on GP 2013 RTM: Biggest Release for GP in Two Decades! 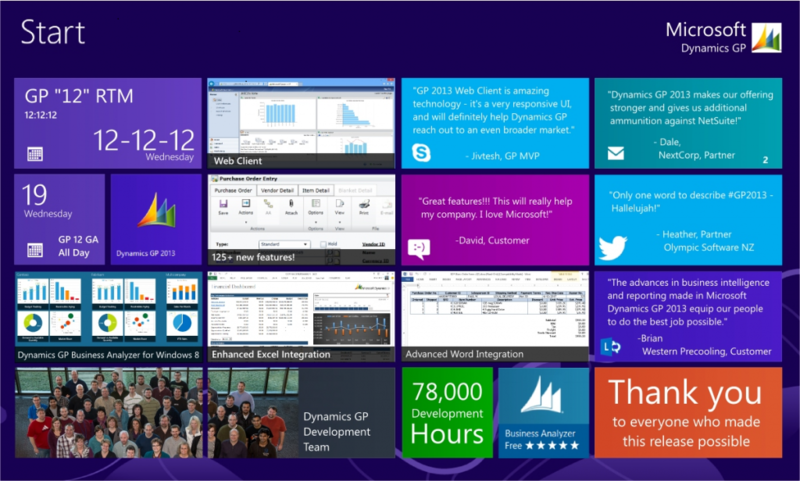 GP 2013 RTM: Biggest Release for GP in Two Decades! There are a lot of exciting things happening with the release of GP 2013. After 78,000 hours of development time the engineers at Microsoft have created a release to manufacturing (RTM) build for GP 2013. This is thebiggest release since the change from Great Plains Accounting to Great Plains Dynamics in February 1993. RTM adds 125+ new features to GP 2013, the most exciting being the web client as an additional deployment option. The Dynamics GP Development Team celebrated the release of manufacturing by signing this banner which will hang, with much deserved pride, at Microsoft’s Fargo campus. RTM is available today, December 19, 2012. Don’t miss out on your opportunity to use the most equipped technology for your business. To learn more contact InterDyn BMI or visit our website at http://www.interdynbmi.com/. Posted in About Microsoft Dynamics GP, Dynamics ERP for Manufacturing, ERP Software Information, Microsoft Dynamics GP 2013 | Comments Off on GP 2013 RTM: Biggest Release for GP in Two Decades!